Cities have grown and developed thanks to rural– urban migration and internal population growth, with new arrivals gradually becoming incorporated into the formal economy and accessing better-quality services in some cases. In the past, in-migration from rural areas and across borders was an important driver of economic growth and cultural and social diversity. Even so, many urban governments are reluctant to support integration, hoping to deter further rural-to-urban migration, due to common, long-held views that rural-urban migration transfers poverty to cities, among other reasons. Meanwhile, large-scale, sudden population movements, prompted by both rapid-onset ‘natural’ disasters such as floods and ‘man-made’ disasters like conflict are on the rise, seeing increasing numbers of displaced people moving into urban areas. This represents a significant stress factor, in particular for towns and cities with already weak formal institutions that face difficulties in delivering adequate basic services to growing populations. Changes in patterns of human mobility, including increases in mass displacement into urban centres, may also strengthen capacities in ways that are not well understood; for example by bringing new skills and knowledge of dealing with climate change risk. With many cities experiencing this kind of population growth, strengthening resilience to deal with mass displacement is a pressing concern. This paper* examines all forms of migration: forced and voluntary, domestic and cross-border, and in response to different pressures (particularly disasters and conflict). It assesses the impact of mass displacement on the wellbeing of all urban residents, using an urban resilience framework that focuses on the social and economic sub-systems – namely, shelter, health care and protection; basic service provision; economic development and employment; and social and political inclusion and community cohesion. 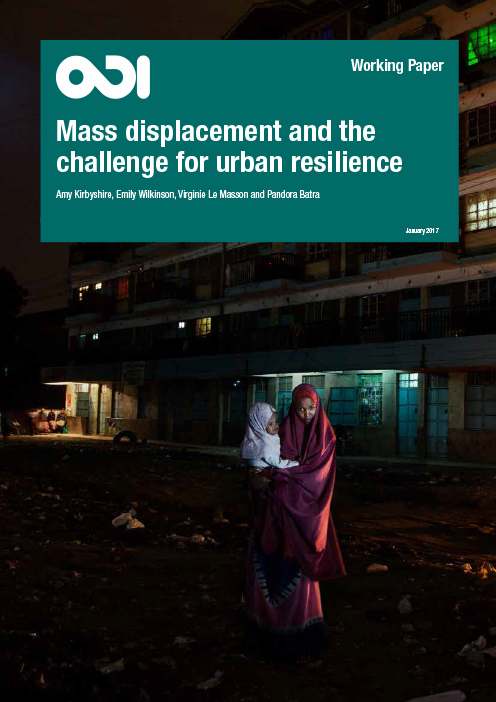 It also explores the politics of resilience to mass displacement into cities and provides insights for moving towards a more progressive policy and research agenda on mass displacement to urban areas. *This paper is available to download from the right-hand column or from ODI's website here. Other papers in this series are available on the ODI website. The key messages are provided below (references have been removed) - please see the full text for much more detail. Figure 1 from page 7 of the working paper: Numbers of internally displaced people owing to conflict and disasters in 2015. Source: IDMC (2016). Green = Total internally displaced by conflict and violence, as at end 2015. Orange = Proportion of which new internal displacements by conflict and violence in 2015. Red = Proportion of new internal disaster displacements in 2015.
and that city and national governments may be failing to take full advantage of the capacities and skills of the new arrivals, and to learn from recent experience to stimulate improvements in urban resilience over the long term, promoting wellbeing for all residents. The World Economic Forum’s 2016 Global Risk Report recognises large-scale forced migration and displacement (induced by conflict, disasters, environmental or economic reasons) as the first most likely, and the fourth most impactful, current risk for humanity. The mass displacement of people from conflict and disaster zones to urban areas puts pressure on shelter, security, service provision, the local economy and social relations. Mass displacement requires host cities and governments to consider not only the response capacity and needs of the existing population, but also that of new populations. This presents a challenge for urban resilience frameworks as most only focus on the characteristics and capacities of the current system, and urban resilience has to ensure wellbeing outcomes for the whole population. The challenges of mass displacement underscore the importance of ‘integration’ and ‘adaptiveness’. In particular, urban governance should support integration, affording rights and opportunities to new arrivals. The arrival and presence of displaced populations are less likely to be perceived as a threat if these groups are recognised and plans are made to anticipate and respond to the potential pressures on security, services, the economy and community relations described above. Security of tenure and a ‘right to the city’ is a key issue for integration: this needs to be extended to all urban residents regardless of how long they have lived there or the circumstances under which they arrived. This is important for new arrivals to be able to pay for and access basic services. Legal recognition helps new arrivals protect themselves or receive protection from the state, and is vital to promoting positive social and economic behaviour. A study of over 500 urban refugees in Beirut, Delhi, Quito and Kampala, found that newcomers accessed community-based protection by building links with their host community. Governments and donors should therefore work with relevant host community organisations to overcome barriers to engage with refugees, and with community-based organisations that are led by or involving refugees. Newcomers can bring a range of assets to urban economies, stimulating consumption and innovation and offering employment to local people. By issuing work permits, recognising skills and helping people access jobs and training, it will be possible to recognise the potential contribution of displaced populations and reduce the damaging impact of higher levels of unemployment and sub-employment. International policies and the development community could focus more explicitly on helping refugees and displaced people transition into self-reliance. This is even more important in light of the slow and unstable growth the world is currently experiencing, which may further limit countries’ absorptive capacities. Effective, transparent and equitable law enforcement and crime prevention are required to prevent and/or deal with potential conflict and tensions between migrant and host communities. An established and efficient as well as transparent justice, law and emergency service system provides the social stability needed to take advantage of the positive impacts of the arrival of displaced people. Urban development planning that incorporates some redundancy, would respond better to the challenge of mass displacement. Measures such as the creation of land banks, land use zoning, city monitoring and data management, efficient planning approval processes and upgrading of informal settlements can be adapted to account for changes in population dynamics and the specific needs of long-term, more established, residents and new arrivals. the impact of displaced communities on the cost and availability of food, housing and jobs. Reports that advocate on behalf of urban internally displaced people/refugees do not do so on the basis of a deep understanding of the survival and livelihood strategies of these populations; and they fail to consider their effects on settled populations and municipal and national authorities. In particular, case studies on different regulatory environments (restrictive versus open), different phases of a displacement crisis (e.g. emergency, protracted, return) and categories of displacement (e.g. refugees, IDPs and people displaced in the context of a natural disaster) are needed. There is very little research on the more positive impacts of those forced to flee and move into cities. In particular, there may be opportunities for urban poor communities to become more organised and advance their collective needs and interests.